Fans who braved the elements on Monday night to go to the basketball game were rewarded with a hard-fought and well-deserved 63-52 victory over the Clemson Tigers. The win snapped a ten game losing streak to the Tigers (15-11, 7-7 ACC), who came to Atlanta fresh off a 21 point beat down of Virginia Tech and were 5-2 in their last seven games. 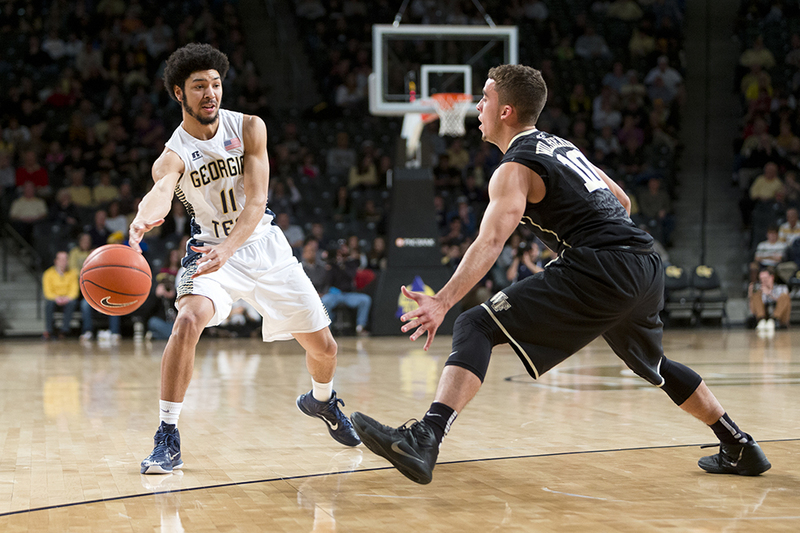 The Jackets (12-14, 3-11 ACC), who had lost four out of their last five and 11 of 13 since the New Year, were sparked by point guard Josh Heath, who led all scorers with a season high 14 points along with three assists, three steals, and was a perfect 6-for-6 from the free throw line. Forward Demarco Cox put up 12 points for the second straight game and pulled down nine rebounds. Forward Marcus Georges-Hunt contributed 11 points and four rebounds, while forward Robert Sampson grabbed a season high ten rebounds to go with four points. It was a welcome win for Tech, who has fallen victim to several extremely close losses this season. In the last month alone, the team has lost to N.C. State by one point in overtime, Virginia Tech, Florida State, and Boston College by two points each, and No. 4 Duke by only six points. The Jackets never trailed Clemson all game, opening with a 6-0 lead, and went into halftime with a 23-21 lead. After Clemson guard Damarcus Harrison tied the game at 32 with 12:14 left to play, Coach Gregory’s men went on a scoring run (keyed by great defense and getting out on the fast break) to take an 18 point lead with 4:56 remaining. Heath made all four of his free throws to keep the game well out of reach in the final minute. On defense, Tech was able to hold Clemson to just 36 percent from the field and 27 percent from beyond the arc. Clemson forward and leading scorer Jared Blossomgame was held to just ten points, tied with backup guard Austin Ajukwa for the team lead. The home team, meanwhile, shot 46 percent from the floor (36 percent from deep) and had 15 assists, which tied a season-high. An important development to note was the absence of starting guard Chris Bolden from the lineup and even the bench. According to Gregory, Bolden has been suspended “indefinitely” for “not adhering to the standards of the program.” Last year former guard Solomon Poole was also suspended indefinitely and never played at Tech again. “We have high expectations for our student-athletes and he hasn’t met those expectations,” Gregory said. Freshman guard Tadric Jackson (coincidentally Bolden’s cousin) got the start instead, finishing with just four points, but had five crucial assists and only one turnover in a career high 29 minutes of play. Gregory backed up Cox’s endorsement of Jackson, saying that the freshman earned the start through his “great effort and unbelievable attitude” over the last two weeks. Coach Gregory was quick to insist that both the team and individual players have “drastically improved” in this last stretch, despite the lack of tangible results to back it up. He also gave credit to the players for their mental resilience through tough losses. There are only four games left in the regular season, but they include two games against No. 15 North Carolina, a nationally-televised home game against No. 12 Louisville (Monday night on ESPN), and another game against Clemson on the road. Tech will look to finish the year strong by building off Monday’s success on Saturday at UNC.